This year, eight teams registered to take part in the Boys Juniors 18 & Under division of the NACBAIT. Following round robin play within the respective pools, a challenge round allowed each team the opportunity to advance to the medal round as teams would face an opponent from the opposite pool. The seedings held true with one exception as the NY Maximum Output Warriors 18's Gold upset the Philadelphia Suns 18A 39-35 in an exciting come from behind win after trailing by as much as 10 in the first half. For the 4 teams reaching the medal round, their Semifinal games would be their 5th game in less than 24 hours but energy was not in any short supply here. These youngsters clearly had energy to spare as they sped up and down the court at breakneck speeds. The first Semi was a big MOW powwow as the defending Champion MOW 18 Blue team met up with the younger MOW 18 Gold team. MOW Gold hung in there for about half the game before they just gave up and only scored 6 points in the second half. Menley Khuu led the Blue team with 12 points as they coasted to a 45-18 cakewalk. The other Semifinal saw the undefeated Toronto CCYAA 18's face the 3-1 NY Young Life Rockits. The core of this year's Rockits team has been together for a couple of seasons, and they had been cleaning house all year long in almost every major Juniors competition. Toronto on the other hand, featured an almost entirely new lineup as they seemed to be working on their team chemistry throughout pool play. Heading in, New York seemed psyched for this game and many people had pegged them to pick off last year's runners up. In the first half, NY played the game at their tempo, forcing the ball inside to big Howie Chu for 8 first half points. Toronto meanwhile was settling for the long distance shot, where they hit 3 of 8 before halftime. Toronto led 15-13 but it appeared that the Rockits were going to be able to pull out the win if the game kept going at such a pace. However, in the second half, the Rockits twin towers of George Tang and Howie Chu had some serious foul problems. Coach Jeff Fong implored his Toronto youngsters to keep attacking and the strategy worked flawlessly. High flying guard Andrew Suen registered 17 for CCYAA as Toronto kept their record unblemished with a 43-33 win. The Finals game was a carbon copy of last year's chip, as an improved Warriors 18 Blue team prepared to defend the title against the Toronto CCYAA 18's. Both teams entered this year's title game with undefeated 5-0 records and legitimate title aspirations. With Larry Ma and Andrew Suen swishing early from outside, CCYAA was looking solid. The usually superb NY guard tandem of Nick Mui and Justin Kao was struggling through their worst game of the tournament and it seemed to be anyone's trophy for the taking. But in the second half, an unexpected thing happened. 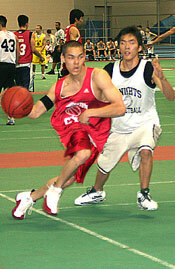 The often overlooked Daniel Wong (13 points, 3 steals) had the most remarkable half of his young basketball career. 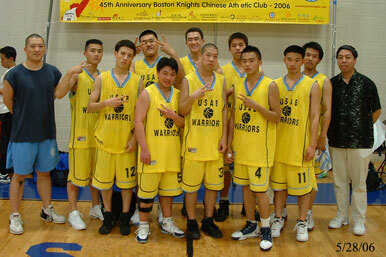 By stepping his game up a level, he was able to lead his team to the Championship with an inspirational MVP perfomance. NY was able to retain their bragging rights with a 49-30 win. They will go for the three-peat next year in Arizona. Congrats to NY MOW 18 Blue on the 2006 NACBAIT Boys Juniors 18 & Under Championship.